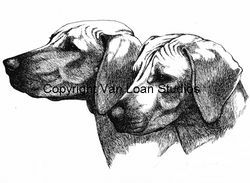 A handsome depiction of two beautiful Ridgeback heads is a Limited Edition Print by artist Martha Van Loan. Print size is 11x14 and is serially numbered and signed in pencil. Mats and Frames are available to finish this collectible print to a 16x20 finish size. See our Framing section for options.